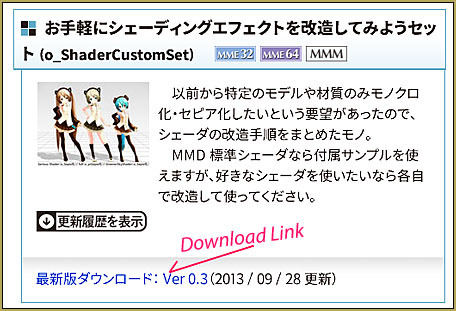 Where can I download o_ShaderCustomSet_v0_3? How do I use o_ShaderCustomSet_v0_3? 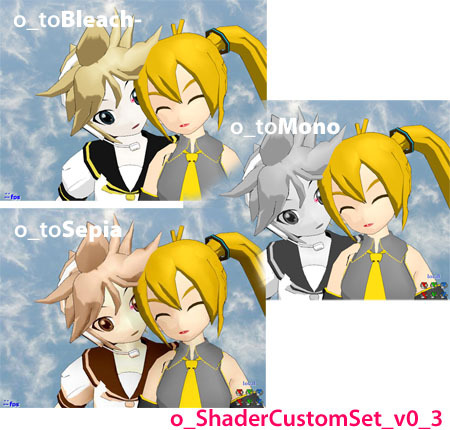 I load the o_ShaderCustomSet_v0_3 effect and nothing happens. A reader emailed me a question about how to use the o_ShaderCustomSet_v0_3 effect. I had never seen it, before… so I did a search and found its source page. Wow! There are MANY effects available from that page. I used Google Translate to help me read that page… the translation made it easy to find. When you open the zip folder, you will see that you have a .x file, typical for any MME effect… and four folders. 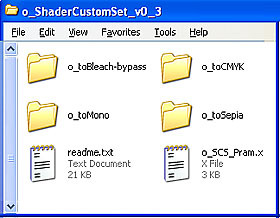 EACH of those folder contains a .fx file. To use the effect, you load that .x effect file… and see that: nothing happens. 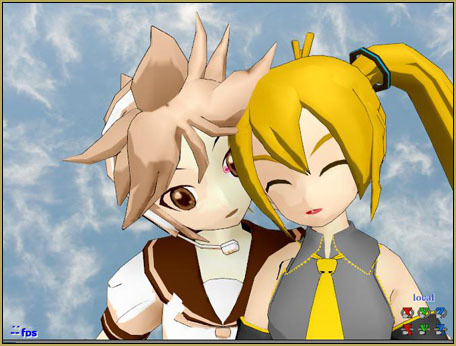 Then you click that MME button on the upper right of MMD’s screen and choose Effect Mapping. You then “set effect” and apply the effect of your choice to your model using one of those .fx files. Each of those effects is controlled by the Tr transparency setting in the AMP. A setting of 1.0 is maximum effect… and a setting of zero will effectively turn off the effect. You can register those settings in different frames to cause smooth transitions from “normal” to shaded. I translated the ReadMe into broken-English using Google Translate and, aside from the basic use of this effect, you can also add elements of it into OTHER shader effects. 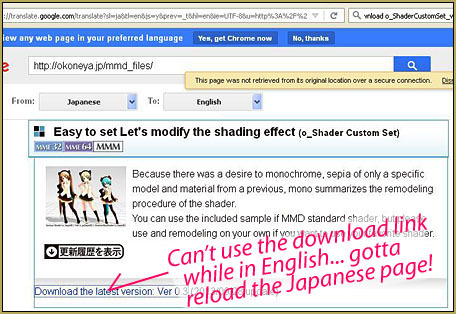 The instructions mention particular shaders and the exact lines of code to be modified or replaced as you edit them. … I have the translated ReadMe file for you. It’s tough to read, tough to comprehend because the translation is so poor… but looks to hold much promise for those MMDers who enjoy tinkering with effects.